Yeah, so they were looking for trouble and they found it. I will speak on this in a later video. Right now this is about the Blood Moon on MLK day in 2019. 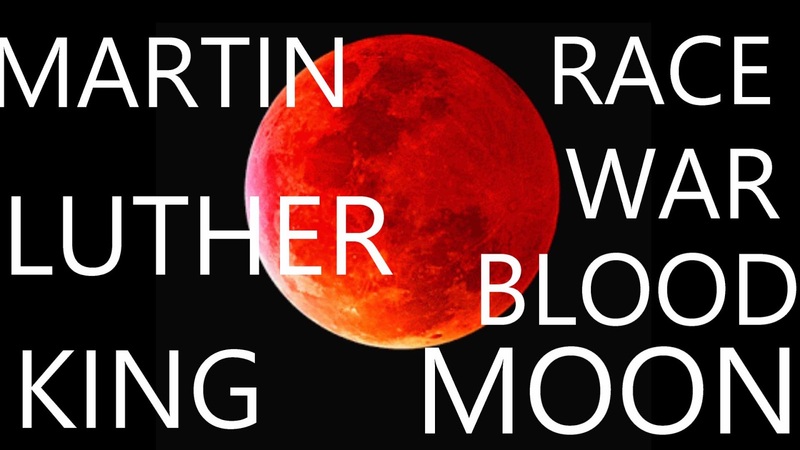 Did you know that 9 Days (9 in the Number of Prophecy) after Martin Luther Kings Assassination was a Blood Moon? Our people have been blinded and asleep ever since Martin Luther King died. The end of the Blinding is now. This is why right after the Blood Moon the Covington Catholic Incident happened revealing the Hebrew Israelites (not Black Hebrew Israelites) to the world. Many of the Israelite Camps preach the end is soon, and this is true. Not soon in our time, but soon in God's time. Not only the whole world doesn't know this gospel, but most of our people do not know this truth. A lot of Israelites only see the growth of their congregations, their you tube channels and think that they have already gathered up the 1/3rds and the 2/3rds are soon to be doomed. There has to be over 1 billion Israelites by Race and at the most (I'm being generous) 25 million of them have been woken up. The Blood Moon was the beginning of the awakening. It was the book end on a Dark Age that started from Martin Luther King's death to today. Many Israelites disagree with this statement, but Martin Luther King was a type of Joseph for our people. God presented to me that this Hebrew Israelite Knowledge will become common and widely accepted as the truth throughout the entire earth. I will speak of this in later videos. The End is Nigh, but not today in this era. FOR THOSE WHO THINK THE END IS TODAY. DID THIS HAPPEN ON THE 2019 MLK DAY SUPER BLOOD WOLF MOON? Blood Moons are a Book end to an era. Did you know that 9 days after the Martin Luther King Assassination there was a Blood Moon? Between then and now Blacks fell into a deep sleep. This Blood Moon was a book end of that time, Though, I said been shown the return prophecies of 2019 are false. The year 2019 leading into the 2020 US Presidential campaign is going to be the beginning stage of the mass awakening. This also means Riots and Chaos. Before a new era of Church. These things are set they must happen. NOW THE CONFEDERATES ARE SAYING NATHAN PHILLIPS IS A SCAMMER- White Supremacist Liberals do what Conservative Mommy and Daddy Says. THEY DON'T WANT THE AWAKENING OF JUDAH, BECAUSE ONCE JUDAH WAKES UP THE OTHER TRIBES WILL WAKE UP. THIS WOULD RESULT IN THE EVENTUAL COMING TOGETHER OF THE NORTHERN AND SOUTHERN TRIBES. Why the Middle East Return of the Jews Prophecy has not come yet. Guess those settlers along the Gaza Strip don't fear, huh? Even the WE WUZ KANGZ racists were half way respectful towards us blacks, but very disrespectful to our native brotha. This truth about Hebrews will become common knowledge. Most will accept the truth, but a small minority will have a Murderous rage and want to "Purge" us. The HOTEPS were respectful as well, and are now proving the point that all free speech is under attack. 8 Again they cry out and say to Pilate, You are not the friend of Cæsar, if you release this man? [note: John xix 12] for he hath declared that he is the Son of God, and a king. But are you inclined that he should be king, and not Cæsar? 9 Then Pilate filled with anger said to them, Your nation hath always been seditious, and you are always against those who have been serviceable to you? The real reason why they see us as dangerous. By the time of the great Greek epic poet and historian Homer, the Greeks were commonly referred to as DANAANS. Homer himself uses this term almost exclusively in his writings. This should not be taken as meaning that all Greeks were descendants of Dan. The indigenous population of Greece is descended from Javan, one of the sons of Japheth, and this name is utilized throughout Jewish history as a reference to the Greeks. The invasion of Edomites, Danites, and certain other Israelite peoples did not replace the original inhabitants of the land, but merged with and co-existed with them. The arrival of these various immigrants did, however, unquestionably set the stage for the rise of the high Greek civilization with which everyone is quite familiar, and certain of them did indeed become the dominating forces in Greek history from around 1400 B.C. onward. The problems associated with Dan are quite evident just in this single incident involving the destruction of Laish. Perhaps the most significant of them all was the fact that the tribe of Dan embraced idolatry and false worship more readily than any of the other children of Israel(though all were eventually guilty of doing so to one degree or another). In many respects, the willingness of the Danites to adopt strange gods and other religions in place of the worship of Yahweh, and to quickly establish a base of operations for the development of their idolatrous practices, proved very enticing to many of their fellow Israelites. Dan, in essence, became the facilitator of paganism for the children of Israel, and as such, the main polluter of God’s way among the people. The choice of territory in which the Danites ultimately settled is, in itself, quite strategic. First of all, it put them as far away as possible from the rest of the nation, and especially from Shiloh, where the center of Yahweh-worship in Israel was situated at this time in their history. In positioning themselves in this fashion, they were subjected to great temptation by the heathen societies to the north and west. Inevitably, given their location, they came under the influence of the people about whom we have already learned so much–the Edomite Phoenicians. 4 I know that in the last days ye shall depart from the Lord, and ye shall provoke Levi unto anger, and fight against Judah; but ye shall not prevail against them, for an angel of the Lord shall guide them both; for by them shall Israel stand 5 And whensoever ye depart from the Lord, ye shall walk in all evil and work the abominations of the Gentiles, going a-whoring after women of the lawless ones, while with all wickedness the spirits of wickedness work in you 6 For I have read in the book of Enoch, the righteous, that your prince is Satan, and that all the spirits of wickedness and pride will conspire to attend constantly on the sons of Levi, to cause them to sin before the Lord 7 And my sons will draw near to Levi, and sin with them in all things; and the sons of Judah will be covetous, plundering other men's goods like lions 8 Therefore shall ye be led away with them into captivity, and there shall ye receive all the plagues of Egypt, and all the evils of the Gentiles 9 And so when ye return to the Lord ye shall obtain mercy, and He shall bring you into His sanctuary, and He shall give you peace 10 And there shall arise unto you from the tribe of Judah and of Levi the salvation of the Lord; and he shall make war against Beliar 11 And execute an everlasting vengeance on our enemies; and the captivity shall he take from Beliar the souls of the saints, and turn disobedient hearts unto the Lord, and give to them that call upon him eternal peace 12 And the saints shall rest in Eden, and in the New Jerusalem shall the righteous rejoice, and it shall be unto the glory of God for ever 13 And no longer shall Jerusalem endure desolation, nor Israel be led captive; for the Lord shall be in the midst of it [living amongst men], and the Holy One of Israel shall reign over it in humility and in poverty; and he who believeth on Him shall reign amongst men in truth 14 And now, fear the Lord, my children, and beware of Satan and his spirits 15 Draw near unto God and unto the angel that intercedeth for you, for he is a mediator between God and man, and for the peace of Israel he shall stand up against the kingdom of the enemy 16 Therefore is the enemy eager to destroy all that call upon the Lord 17 For he knoweth that upon the day on which Israel shall repent, the kingdom of the enemy shall be brought to an end 18 For the very angel of peace shall strengthen Israel, that it fall not into the extremity of evil 19 And it shall be in the time of the lawlessness of Israel, that the Lord will not depart from them, but will transform them into a nation that doeth His will, for none of the angels will be equal unto him 20 And His name shall be in every place in Israel, and among the Gentiles 21 Keep, therefore, yourselves, my children, from every evil work, and cast away wrath and all lying, and love truth and long-suffering 22 And the things which ye have heard from your father, do ye also impart to your children that the Saviour of the Gentiles may receive you; for he is true and long-suffering, meek and lowly, and teacheth by his works the law of God 23 Depart, therefore, from all unrighteousness, and cleave unto the righteousness of God, and your race will be saved for ever 24 And bury me near my fathers 25 And when he had said these things he kissed them, and fell asleep at a good old age 26 And his sons buried him, and after that they carried up his bones, and placed them near Abraham, and Isaac, and Jacob 27 Nevertheless, Dan prophesied unto them that they should forget their God, and should be alienated from the land of their inheritance and from the race of Israel, and from the family of their seed.